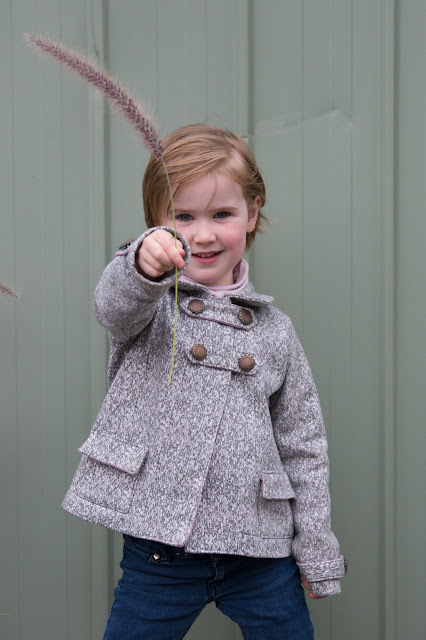 Bartacks and Singletrack: Neat and Lovely Girl's Clothes - jacket "W"
I have some lovely green wool that I bought way back when she was born which has always been intended for her first School Days coat, but has now been cut up to make a different coat altogether. But first I wanted something a little more carefree than a wool coat. Spotlight was having a 30% off sale and so this "platinum fleece" was picked up quickly and cheaply and immediately sewn into this little jacket. It's delightfully soft and fleecy on the inside, so I was happy enough to relax my fussy standards and not draft a lining. The jacket pattern has a facing, and the pattern instructions appeared to suggest a nice, contrasting fabric. I say "appeared to suggest" as I don't understand a word of Japanese and sew purely by referencing the wonderful diagrams and a bit of guess work. For my facing and the undersides of the button tabs I chose a little leftover remnant of a pink/grey knit that I've now completely used up. It's cute that you just see it peeking out from under the pocket flaps too. The buttons aren't functional and the jacket is closed with sew in snaps. I followed the pattern and hand sewed plastic snaps under the buttons on the left side (as worn), but it didn't look secure enough and was threatening to hang oddly, so I added a couple of snaps from my snapsetter which are hidden under the centre of each strap. I wish I'd thought to use snapsetter snaps within the button tabs as I constructed the tabs 'cause they close much more easily and securely than the sew in type. Next time. The collar looks a bit sticky-uppy in that photo, but it mostly lies very nicely due to being constructed of two different pattern pieces. Of course having to draft the jacket, facings, collar pieces, pockets and tabs and add seam allowances to the lot was a days work in itself. But I think the finish is really nice and looking at that sleeve length I won't have to trace the next size for a while! I have become quite a fan of Yuki Araki's sewing patterns. I feel they have a level of tailoring and design that makes them much more finished and lovely than you might perceive or expect a Japanese sewing pattern to be. 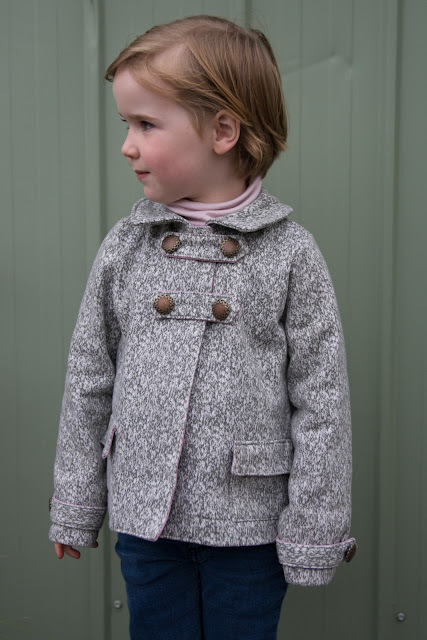 This book, Neat and Lovely Girl's Clothes was reviewed on Japanese Sewing Books blog and thankfully Yifarn has taken lots of photos of all the patterns. Go take a look, it's a book choc full of gorgeous patterns. ﻿I don't often think about the cost or cost savings of making my kid's clothes. I just do it because I enjoy doing it. 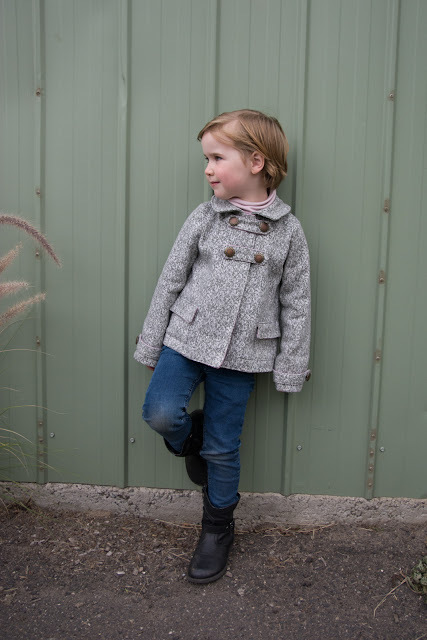 but when a little jacket like that can be made from about $8 worth of fleece, maybe $1 worth of buttons and some leftover bits then I feel pretty happy about my hobby! And I'm pretty happy with my little model! She was totally into the idea of a photo shoot, has been regularly declaring that she loves everyone, that I'm the best mum in the whole wide world and is just generally being incredibly positive. I hate to wonder how long it will last, but hey, while she's declaring I'm the best mum I'm totally on board with her being the best daughter in the world! Thanks Krista, especially thanks for stopping by the blog to comment. Yuki Araki's pattern rally are lovely. I could happily collect all her books. Fantastic coat! I can't get over that fleece! Thanks Courtney. I don't usually get excited by the big box store fabric, but this really is a nice quality sweater fleece. I couldn't resist. 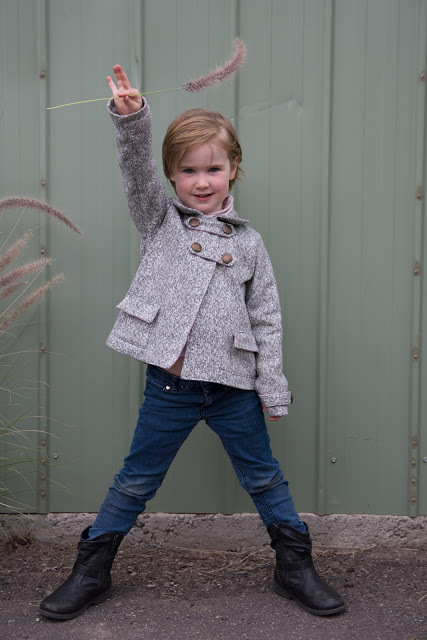 Adorable jacket and gorgeous model. I love all the little details like the pocket flaps and button tabs - and I think yours is even nicer than the one pictured in the book. Hope it gets lots of wear! Aw Marisa you're the best. I do really like the version in the book but figured polar fleece was a bit too casual a look. 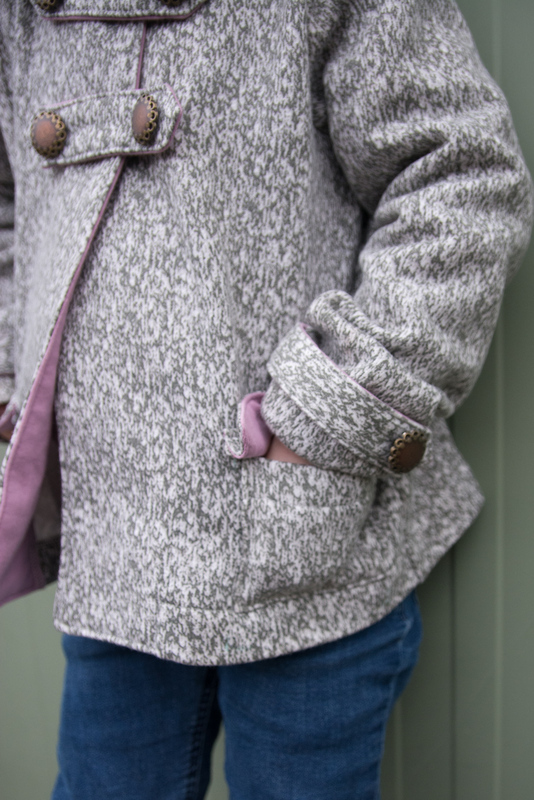 The sweater fleece gives one polished side and one warm, snuggly side. Perfect! Well done to the best mum in the world 😉 the jacket looks awesome. I also find that getting my fussy wearer involved in the process of making clothes for her helps. That button shop sounds like heaven on earth! Well, the best mum in the world did jinx herself by typing how nice the kid was being. Turned into the angriest mum in the world by bedtime! Buttonmania is amazing. On a regular day you ask Kate what you want, show her your project and she finds you the perfect button, almost like a scent hound tracks a criminal! On the Monday warehouse days you get to rummage yourself. Awesome! What a great coat! I love the little pocket flaps and other details. I'll have to check this book out next time I'm at the Japanese bookstore downtown. It looks like a winner! this is certainly one of those books where there's no project that I don't really like. Wow, this is lovely. And I love the styling with the boots. Also I can't believe that's fleece - it looks so sophisticated! Well done. Thanks Masha. It's nice when cheap + washable+ kid friendly = sophisticated dressing. SO CUTE. i love this coat and am seriously impressed that it's from a japanese sewing book - those patterns are usually so basic and simple, and this looks like a "real pattern!" haha. i mean i always like their style but this has details i wouldn't expect. anyway. the jacket is great, your daughter is adorable. THanks Kristin. I know what you mean. there are only so many oversized, linen tunics that a kid can wear, and mine certainly aren't keen on the apron style dress that requires a whole extra garment underneath to stop your bum showing. I have to say that the Yuki Araki books do tend to have very nicely constructed garments. The order of sewing or finishing can sometimes do with a bit of an Oliver + S style tweak but otherwise they're lovely. Yuki herself has been said that she likes kid's clothes to look like they fit now, not upsized for next year. I agree! And I'm definitely a fan. 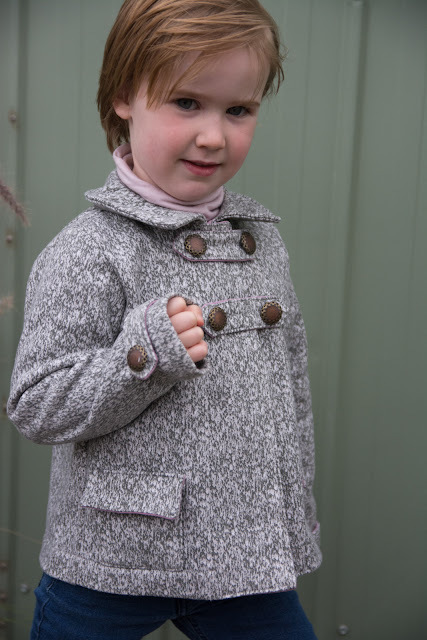 I made a double breasted coat for my daughter once too. She wore it to death, mostly because I built a few years growth into it. I still love it and she out grew it 10 years ago. How wonderful to have made things that you both enjoyed so much. I hope to be so lucky! Anyway, I LOVE this jacket. It is impeccable, Shelley. You are a sewing rock star! Thanks Rachel, you're the sweetest! It's a great little pattern. Your daughters jacket sound so snuggly and looks so expensive, well done and so glad she loves it. I love this jacket! And she's adorable - yes, enjoy those "cooperative phases" as they come! Joe's been a delight lately too, and I'm like, who are you? But I'm not complaining! Just enjoying! Funny how no one ever turns to exorcism to get rid of the goodness, but it's like they're equally "possessed" :) I'm enjoying my little love-y devil! 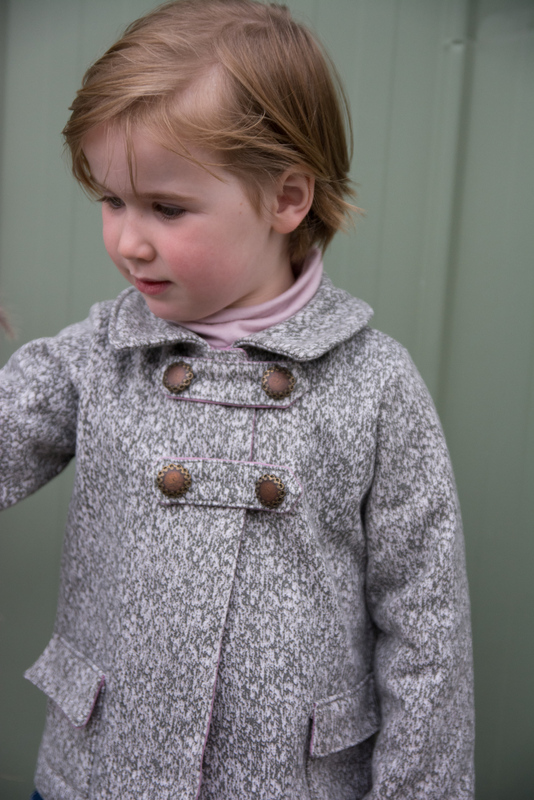 And she is adoring this jacket, it has definitely become the favourite. I hope that helps. If you like you can tell me which pattern you're making and I'll try and find which pattern sheet(s) it's on.